Civil suit in the time of Louis XIII. Home » Civil suit in the time of Louis XIII. 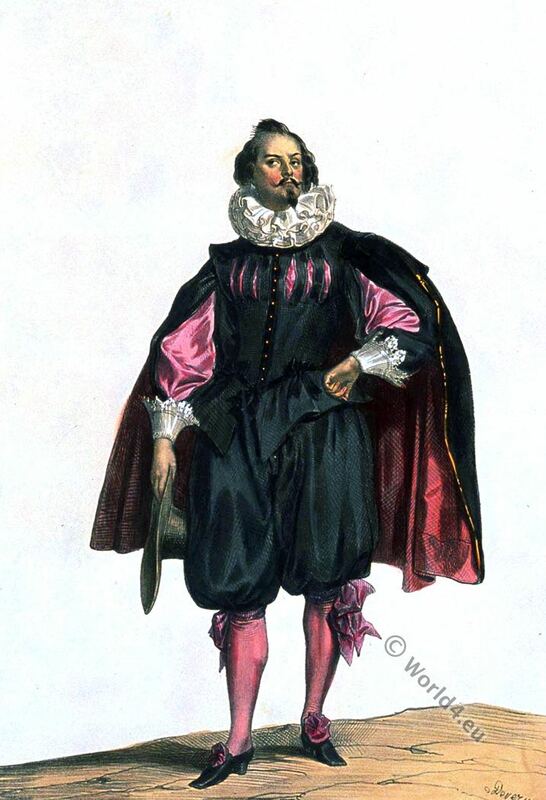 Costume civil du temps de Louis XIII. XVIIe siècle. 17th century. Baroque mode. Man wearing a dress worn during the reign of Louis XIII, holding his right hand on his hat, the left being pressed against his hip. 19th century depiction of a 17th century dress. Hat. Cape (strawberry). Imperial (beard). Illustration: Devéria, Achille Jacques Jean Marie. Lithographer: Motte, Charles Etienne Pierre. This entry was posted in 1620, 17th Century, Ancien Régime, Baroque, France and tagged Baroque fashion, Costumes historiques de ville ou de théatre on 6/22/16 by world4.